Your feedback generates more questions and ideas for our research team to work on. So I decided to take 6 minutes to walk through who scores as The 3 Most Overrated Economists in The World (for @HedgeyeTV video CLICK HERE ). I also crowd-sourced (on Twitter) who my followers thought were the most overrated. We came up with completely different answers. Today, I’d like to throw that right back at you and add the follow-on question – who are The Most Underrated Economists (and/or strategists) that you follow? This has nothing to do with being mean or nice. This has everything to do with competence. We all need to find a better way. In theory, there are “experts” spewing on TV all day long. In practice, you (the players) know who gets it. #Davos is a big deal. CNBC focused on Matt Damon’s "Save the World’s Water" thing yesterday and Reuters is all over actress Goldie Hawn this morning. 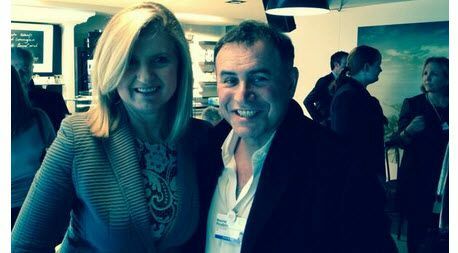 Up next, after living large last night, Nouriel Roubini is Snapchatting the world a picture of him pecking Arianna Huffington on the cheek. Got Commodity inflation in 2014 YTD? In stark contrast to what you would have seen in the Hedgeye Asset Allocation Model for the better part of the last year (0% allocation to Commodities), we have a 9% asset allocation to Commodities right now. From here, that’s going up, not down. 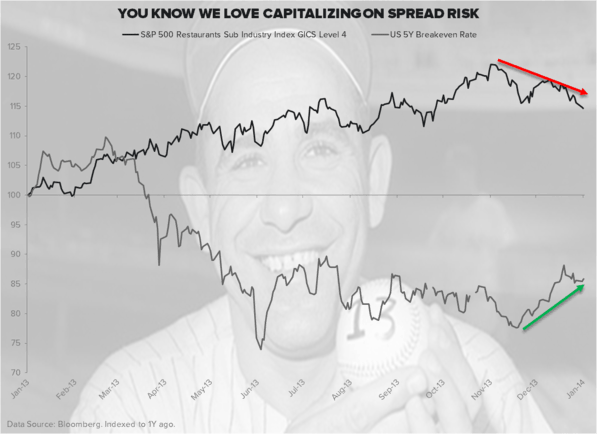 In Real-Time Alerts we are long of Gold in Gold terms (GLD) and Coffee via the CAFÉ (take the little chapeau off the French spellchecker and you’ll see the Coffee ETN – not a perfect security, so if you’re an Institutional investor, just buy the futures). On the other side of this Q1 theme, there are plenty of short ideas to sink your teeth into; Restaurant Shorts in particular (Slowing Sales and Rising Food Costs). This is the highest # of short ideas our Food/Bev guru Howard Penney has had since 2008. He held a Best Short Ideas call last week @Hedgeye on Cheesecake Factory (CAKE). And he’ll write the Early Look for you tomorrow. 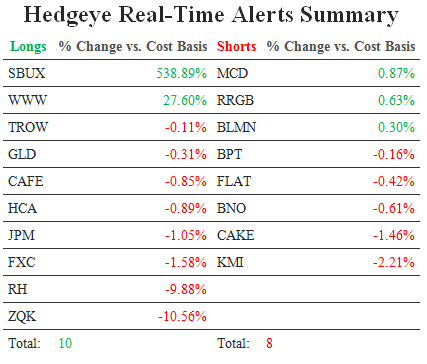 In other words, 50% of my #timestamped short book is in Restaurant Shorts (10 LONGS, 8 SHORTS currently @Hedgeye after selling into yesterday’s all-time Russell2000 high of 1181). In another @HedgeyeTV video this week titled Here’s What’s Working (for video CLICK HERE), I made a very simple point about our #GrowthDivergences theme (which syncs with #InflationAccelerating): country and sector picking matters as much as stock picking right now (i.e. pick the right sectors in the right countries and you’ll look like a good stock picker!). Since the European growth recovery is 1-2 years behind the US (and most of Asia, including Japan), that’s the other reason why we think you’re going to continue to see European Equities outperform the Global Equities league tables. Remember, in theory consensus might think it’s about absolute levels of growth. In practice, it’s all about the rate of change of growth. And that’s all I have to say about that.